My dad used to make the best Napoletana sauce when we were growing up. Using tomatoes, basil, onions and often an entire bulb of garlic, he would gently simmer the sauce for hours and serve it with spaghetti. It became a family favourite, and was one of the few recipes I had tucked up my sleeve when I left home, back in the days when I regarded cooking as a necessity rather than a pleasure. A few years ago, I was working on a film shoot with an Italian girl and I told her about our homegrown tomatoes and how I’d cook them slowly over a low heat to serve with pasta. “Back home, we eat the tomato sauce raw,” she said. I tried it and loved it, and since then, this has become my preferred tomato sauce to eat with pasta during the summer months when homegrown tomatoes are plentiful. Aside from the pasta, there is no cooking required, so the sauce can be whipped up in a fraction of the time it takes to cook up a Napoletana, and despite the ingredients being more or less the same, the taste is totally different: fresh, vibrant and redolent of summer. You need 1-2 handfuls of fresh homegrown tomatoes per person and a few fresh, torn basil leaves. Onions are not required as they’d be a little over-powering raw and, likewise, you only need a fraction of the garlic, I only put in 2 cloves if I’m making it for Ade and myself. I still cook Spaghetti Napoletana, and it’s great in the winter months when our homegrown supplies have dwindled and there’s only a tin of tomatoes to hand, but this recipe I keep for our homegrown veg in the summer. It’s always a little bit of an occasion when we have enough tomatoes, garlic and basil to make the first raw tomato sauce of the season, and we regard it as a real treat of a supper as it’s one we can only enjoy for two to three months of the year. It really is simple, seasonal eating at its best. Roughly chop the tomatoes and place them in a large bowl, along with all their juices. Chop the garlic and add to the bowl. Tear the basil leaves and add to bowl. 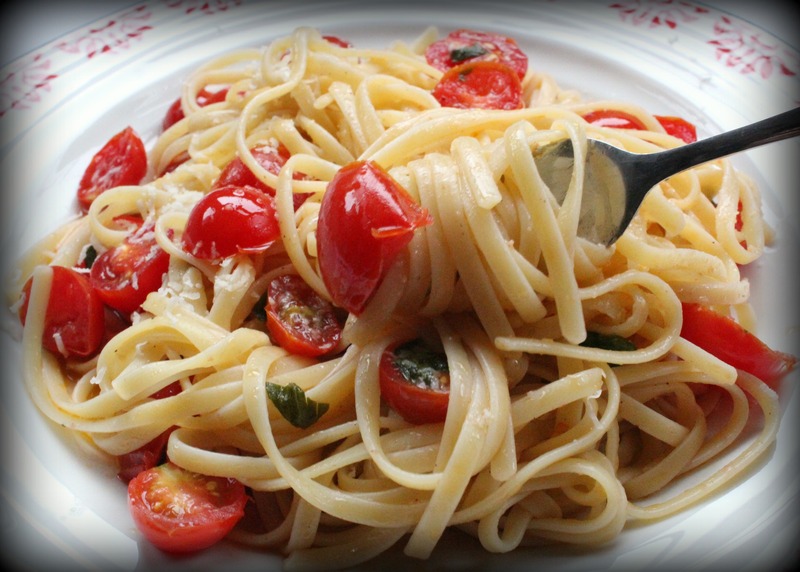 Bring a pan of salted water to the boil and cook the linguine according to the packet instructions, giving the bowl of tomatoes an occasional stir while the pasta cooks. Drain the pasta before tossing it in the bowl of tomatoes. Stir well to make sure the pasta is evenly coated in the sauce. Funnily enough, I can across this recipe in a book in a charity shop this morning! Sadly, I didn’t grow any basil this year.